Formerly Be Whole. Be You. 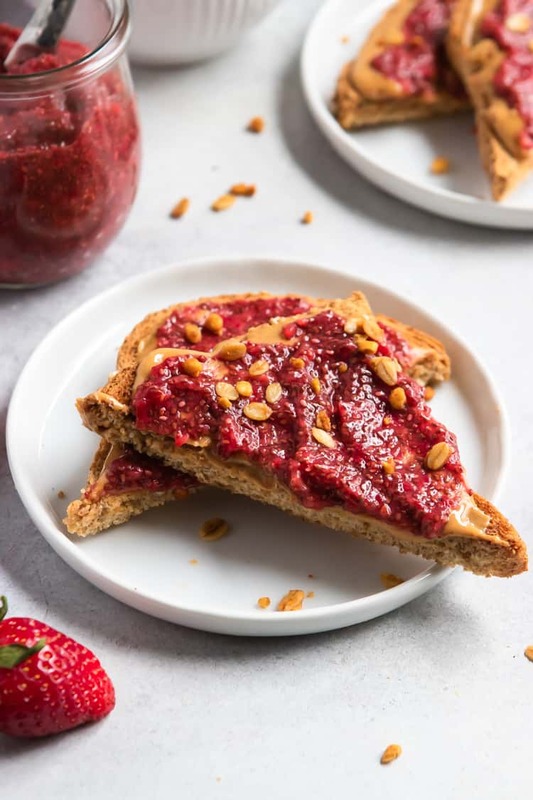 This homemade Strawberry Chia Jam is a no cook, no hassle, delicious addition to toast, yogurt, oatmeal and so much more. Simply sweetened with maple and with chunks of real fruit, a great recipe for the whole family! Never have I ever made any sort of jam in my entire life. I always assumed it was some intricate process that required time and skills I did not have. I really love strawberry jam and preserves but my laziness in the kitchen go the best of me time and time again when I thought I should give it a try making my own. You can imagine how surprised I was when I realized that I could make a strawberry or really any fruit jam practically with my eyes closed! 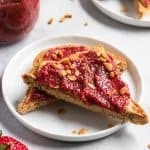 Why is this Strawberry Chia Jam recipe so simple? Well for starters no cooking is required at all. Often stovetop heating and boiling is required but when you add one secret (ok, not so secret since I told you in the title, but you get it.) ingredient, then no heat is necessary. 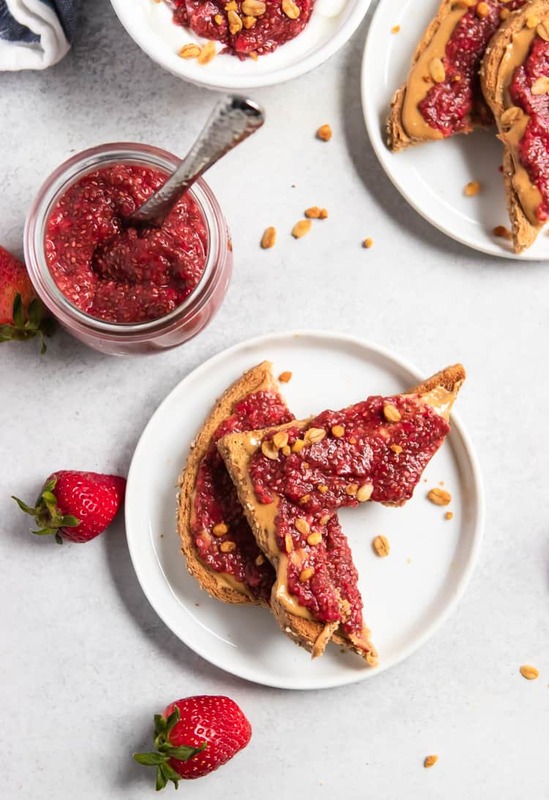 The chia seeds are the trick to this strawberry jam. If you have ever had chia seeds, yes the same seeds that we all remember from the Ch-ch-chia pets years back, you notice what happens as they become hydrated. They expand and soften in any sort of liquid. So when you use them in this recipe, they thicken the jam with just a bit of time. It’s that simple! Sound too good to be true? I thought so too–I mean seriously, nothing in life is that easy! Oh but it is, my friends, It soooo is. First off, what’s so great about chia seeds, aside from those really cool plants you can grow from them? Chia seeds are all the rage right now thanks to the long list of nutritional benefits they provide, but quite honestly, I find them still to be a bit of nuisance since I am always getting caught with them in my teeth. Ugh. But this jam is that simple and that delicious that I risk public embarrassment for it! 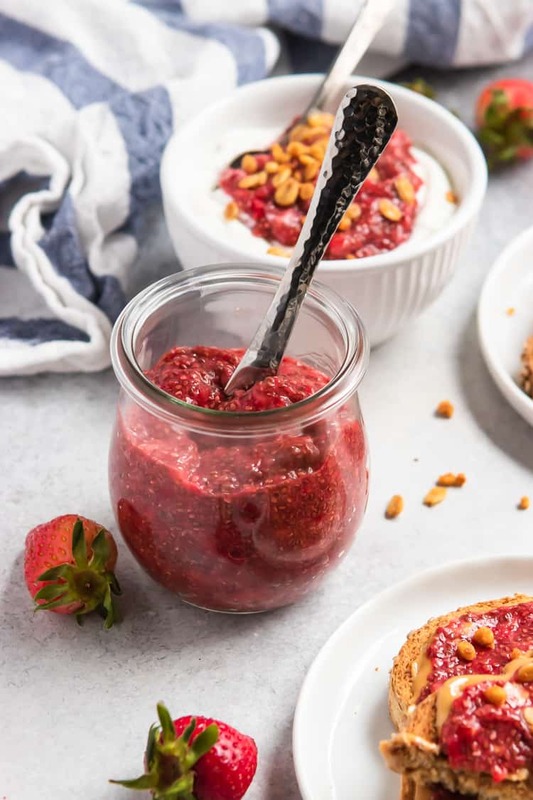 It only takes about 5 minutes if that to prep this Strawberry Chia jam. If you have a food processor then you are pretty much set. The hard part is waiting a couple hours until you can sample it! 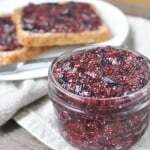 Get creative and think outside of the toast with this jam. Maybe spoon it over some yogurt or use it for a thumbprint cookie recipe. I ate it straight from the jar as well–I know, such a rebel. 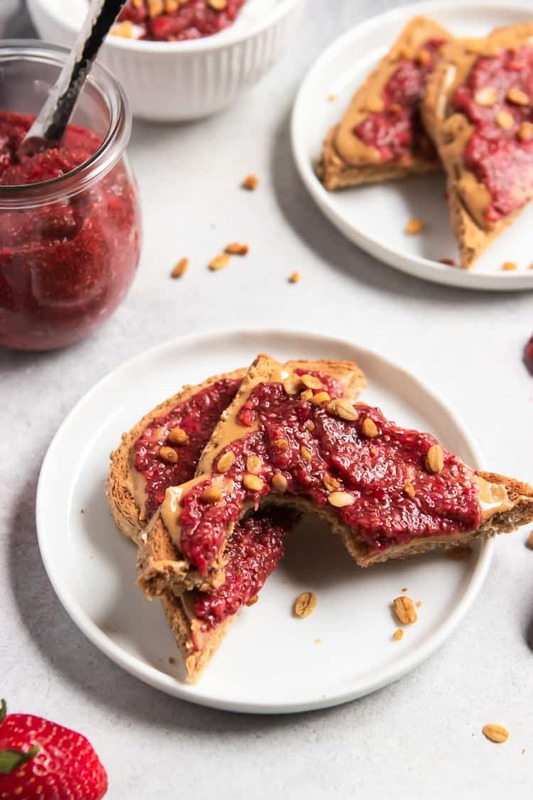 If you are looking for recipes to add this delicious jam to, you could make these crumble bars and really make them any flavor at all. You could also use it in my FAAAAAVORITE PB + J Overnight Oats. Ohh, and then there are these Peanut Butter and Jelly Fudge Cups as well. Hmm, looks it’s time for me to sign off because I now need all of the above!!! DID YOU MAKE ONE OF MY RECIPES? LEAVE A COMMENT AND LET ME KNOW! I ALSO LOVE TO SEE YOUR LEMONS + ZEST RECIPES ON SOCIAL MEDIA–TAG ME @LEMONSANDZEST ON INSTAGRAM OR FACEBOOK! In a food processor, pulse strawberries to puree. I like chunks of strawberries in my jam so I don't process them until completely smooth. Process to the desired smoothness. Pour into a small mixing bowl and stir in lemon juice, maple syrup and chia seeds. Transfer to a glass container with an airtight lid. Cover and refrigerate for about 2-4 hours or until thickened to the desired consistency. Enjoy on toast, in yogurt or straight from the jar! Filed Under: Dairy Free, Gluten Free, Spreads, Jams, Sauces, Etc. That’s a great question. I bet you could, but if you do, freeze it pretty quickly after making it. Since there are no preservatives it doesn’t last too long. Let me know how it works for you! What would the caloric intake be for a tbsp? Hi Lisa! I don’t count calories so I typically don’t calculate them for the recipes. However, This should be pretty low calorie considering the ingredients. I would assume a Tbsp is somewhere from 25-35 calories. You can always plug in the ingredients to a calorie calculator to determine more exact. How long will this last in fridge? Hi Connie! It should stay good for about a week, if it lasts that long, of course! could you use honey for this instead of maple syrup? Would agave work for this recipe? Tiffany, Agave should work just fine. Really any liquid sweetener. I stay away from agave because it is highly processed but I know some people use it for the low glycemic index. Would you be able to make this with frozen berries? Absolutely, Susan! I would just let them thaw before adding them in. So glad you love it! I could eat PB&J every day of the week too. And I’m right with you, cooking strawberries is not my forte so that’s why I went with them fresh when putting this recipe together. Thanks so much for sharing! Hi, I’m from Sweden and was wondering how much 3 T is? What does the T stand for?? Hi there! The T stands for Tablespoon. I assume you use the metric system. When I looked it up, it said a tablespoon is equal to about 15 mL. Does that help? Welcome to lemons + zest!